Rajasthan Subordinate and Ministerial Service Selection Board has been set up in Jan 2014 by state government to recruit capable, talented, highly skilled and eligible candidates. Rajasthan Selection Board does by conducting written tests, personal interview and professional tests wherever required depending upon the various posts. The recruitment notice for Librarian Grade 3 post is updated on RSMSSB’s official website and eligible candidates can apply. Here we are providing you with RSMSSB exam pattern and RSMSSB Exam Syllabus. Apart from this we also provide you RSMSSB Librarian Grade-3 Previous Year Question Paper. Keep reading to find out more. RSMSSB will be a 300 Marks question paper and the maximum allotted time will be 03 hours only. All candidates have to complete exam in limited time. Better preparation tips and extra info about study material is given in last section. Data Sufficiency, Theme Detection, Logic, Analogy, Clocks & Calendars, Alphabet Test, Eligibility Test, Puzzle Test,Coding-Decoding, Series Completion, Logical Venn Diagrams, Alpha Numeric Sequence Puzzle, Inserting The Missing Character, Situation Reaction Test, Number, Ranking & Time Sequence, Classification, Statement – Conclusions, Arithmetical Reasoning, Mathematical Operations, Direction Sense Test, Statement – Arguments, Logical Sequence of Words and Deriving Conclusions from Passages. Unseen Passages,Tenses, Conclusion, Error Correction, Vocabulary, Grammar, Subject, Synonyms, Theme detection, Antonyms, Comprehension, Passage Completion, Word Formation, ­Verb Agreement, Articles, Verb & Adverb, Fill in the Blanks, Idioms & Phrases, Sentence Completion and Sentence Rearrangement. Simplification, Simple Interest & Compound Interest, Number Systems, Ratio & Proportion, Mixtures & Allegations, Profit & Loss, Work & Time, & Surds & Indices, Menstruation – Cylinder, Cone, Sphere, Time & Distance, Permutation, Combination & Probability, Sequence & Series, Data Interpretation and Percentage. History of computers, Input and Output devices, Hacking, Security Tools, Basic Functionalities of MS-Office, Database Managements system, Computer Abbreviations, Networking and communication, Hardware and software, Windows operating system, Internet terms and services, Logic gates, and Viruses, Shorty Keys and Modern Day Technology. We all are aware about what are the past year papers. Whenever we search about any exam there is always a section of Question Papers. They are nothing but previous year question paper for the same exam. These previous year Librarian grade 3 question papers will be helpful for better preparation of RSMSSB entrance Exam. These question paper tend to help you to understand the exam pattern better. With regular practice with Librarian grade 3 papers during exam, question paper won’t be a unknown nightmare to you. Also one can improve time management skill with these papers. So with so many benefits these are paper should be downloaded and used by every RSMSSB aspirant. Here we are providing you with these RSMSSB previous year question paper in pdf format which are easy to download and use. Regular timely practice will be very helpful. Librarian Grade-3 are for each of the aspirants. We also understand that it takes hard work and hours of studies to clear the Librarian Grade-3 Exam. Librarian Grade-3 Previous Year Question Papers at the end of your studies. We are providing the RSMSSB Librarian Grade-3 Previous Year Question Papers for the exam aspirants. In the RSMSSB Librarian Grade-3 exam previous papers, you can start with the final preparations. 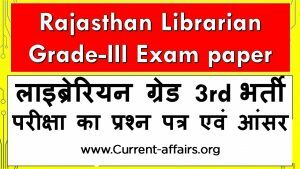 Students do not forget to use these questions paper because the previous year questions papers will play very major role for Rajasthan Staff Selection Board Librarian Grade-3 post exams. All the aspirants want to clear the RSMSSB Librarian Grade-3 Exam, but only the determined students can actually clear it. If you prepare for Rajasthan Staff Selection Board Librarian Grade-3 Post, and you make sure that you are using the Exam previous papers, you can overcome problems related to time and stress. These RSMSSB Librarian Grade-3 previous papers are helpful for the better preparation of Exam. They will help you to understand the Rajasthan Staff Selection Board Librarian Grade-3 exam pattern better.